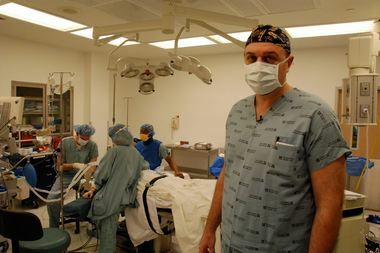 Dr. Daniel Ivankovich was featured on CNN Heroes for not-for-profit work around Chicago. UPTOWN — Dr. Daniel Ivankovich, who was named a CNN Hero earlier this year, has now been named one of the top 10 heroes of the year, netting the Uptown Surgeon $10,000 and the opportunity to become CNN's Hero of the Year. All of the heroes will be honored at the "CNN Heroes: An All-Star Tribute," which will air on CNN at 8 p.m. Dec. 6, according to CNN. To vote for Ivankovich or any of the other heroes, which you can do once a day, click here. The orthopedic surgeon and his work have been celebrated in his field for years, but he was recently spotlit more publicly with the series that celebrates "everyday people changing the world," in July for his nonprofit work. He's no stranger to attention — in 2010, he was also named a Chicagoan of the Year by Chicago Magazine. When Ivankovich and his wife Dr. Karla Ivankovich, née Carwile, saw how hard it was for patients to get basic health services, they founded OnePatient Global Health Initiative, a not-for-profit organization designed to establish sustainable programs of outreach, prevention and patient education at multiple locations throughout Chicago as well as Haiti, according to their website. "What really drove me was [my time at] Cook County Hospital. I don’t really know what it’s like today, but the same patients I was seeing when I was an intern were still waiting for surgery when I was a chief resident," Ivankovich said. "They had waiting lists of almost five years. Hundreds of patients that were basically being ignored for whatever reason. it just didn’t seem very appropriate for me. And 95% of them were African-American and the issue was they were very loyal to the Cook County system." "As a basketball player, I was usually the only white guy. I went through all these [different] areas playing in all-star and all-American games," Ivankovich said. "We practiced down on 83rd, down in Avalon Park. I would go down to see a lot of my teammates that lived in Cabrini-Green, Ida Wells, Robert Taylor. I would go pick them up all the time. Going through all the craziness of broken elevators and having to run up 14 flights of stairs in the middle of the summer, I got a pretty good understanding of what disparity was." For more on Daniel Ivankovich and his work click here.